Creating a mobile version of your blog or website is not as hard as we think, at least there is no programming involved. MoFuse helps site owners to create a mobile version of the website within clicks. Creating a mobile site is simple; just sign up, fill up a couple of compulsory text-fields and your mobile site is good to go. Mofuse is fairly easy to get around with, create a mobile version in few clicks, there’s even an iPhone version too! More options are available in the Dashboard to further customize the mobile site, making it more personalized. 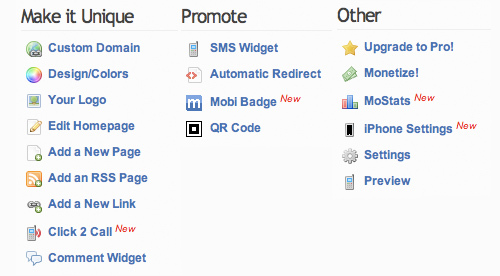 MoFuse is free, but you intend to get more out of your mobile site, MoFuse Professional is $3/month. Click here to see it’s benefits.